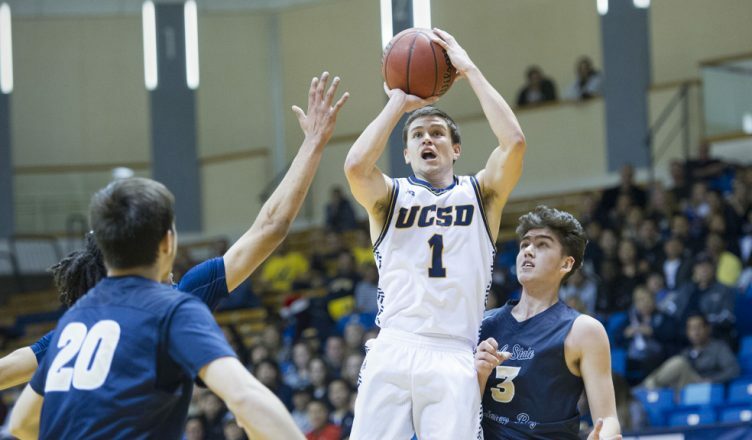 The UC San Diego men’s basketball team moved to 14–6 in California Collegiate Athletic Association play following a loss against Chico State (56–66) and a win against Humboldt State (77–57). After starting off the season strong and holding second place in conference standings, the Tritons have slid down to third place. They are now tied with Cal State San Marcos for the third-place spot, behind second-place Chico State and conference-leading Cal Poly Pomona. The Tritons played well against Chico State in the first half despite trailing 8–0 to start the game. UCSD fought to regain control of the game and traded baskets with Chico State. Both teams were evenly matched for the most part and, going into halftime, the score was 34–33 in favor of UCSD. The Tritons started the second half slowly, letting Chico State pull ahead early with a seven-point lead, 45–38. The Tritons answered back with jumpers by junior guard/forward Christian Oshita and senior forward Kenny Fraser. Chico State sank a three-pointer to keep the Wildcats ahead, but two Triton three-pointers from redshirt freshman guard Mikey Howell and junior guard Christian Bayne tied the game up at 48–48 with 10:54 remaining. Just when it seemed like the momentum had swung back in favor of the Tritons, the Wildcats went on a scoring run, pulling ahead by nine points with 4:44 remaining. UCSD, however, struggled with scoring and were unable to regain control of the game. As the buzzer sounded, UCSD fell to Chico State, 56–66. Bayne and Oshita led the Tritons in scoring with 14 and 10, respectively. The Tritons were outrebounded by the Wildcats — Chico State pulled 11 offensive rebounds compared to UCSD’s five. The Wildcats scored nine points off second-chance points versus UCSD’s two points. Rebounding from their loss against Chico State, the Tritons dominated the Humboldt State Lumberjacks, 77–57. In a standout showing, UCSD never trailed against Humboldt State. The Tritons led by more than eight points for most of the game. The first half was a stomp by the Tritons, and Humboldt State could not find an answer. The Lumberjacks did, however, cut the lead down to two early on in the second half. Despite their scoring run, the Lumberjacks were outmatched by the Tritons. Following the run by Humboldt State, UCSD quickly turned up the intensity, easily notching a 10-point lead with 10 minutes remaining in the game. The Tritons built on this 10-point lead and finished the game up by 20 points, 77–57. UCSD shot very well from the field, finishing with a 49.2 field goal percentage and shooting 36.7 percent from behind the arc. Four Tritons finished in double-figures: sophomore forward Scott Everman (16), Fraser (10), Bayne (24), and Oshita (14). UCSD has two more games remaining in the season; both are at home. The Tritons will play Cal State Dominguez Hills on Thursday, Feb. 22. Tipoff is scheduled for 7:30 p.m.